Keep your files protected and accessible on all your devices with Microsoft OneDrive. 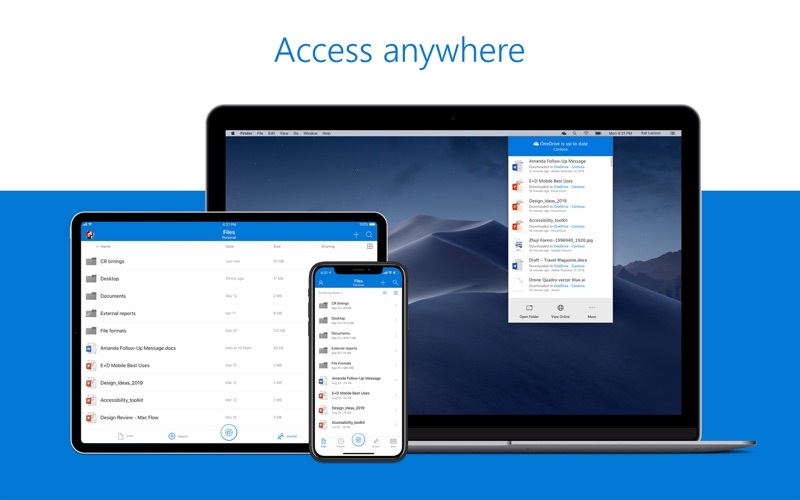 Easily share documents, photos, and other files with friends, family, and colleagues, and even collaborate in real-time in Office. OneDrive can help you quickly organize and find the things that matter most. Anywhere access Easily store, access and discover your personal and shared work files in Office 365, including Microsoft Teams, directly in Finder. Edits you make offline are automatically uploaded next time you connect. Seamless collaboration Work faster and smarter with anyone inside or outside your organization. 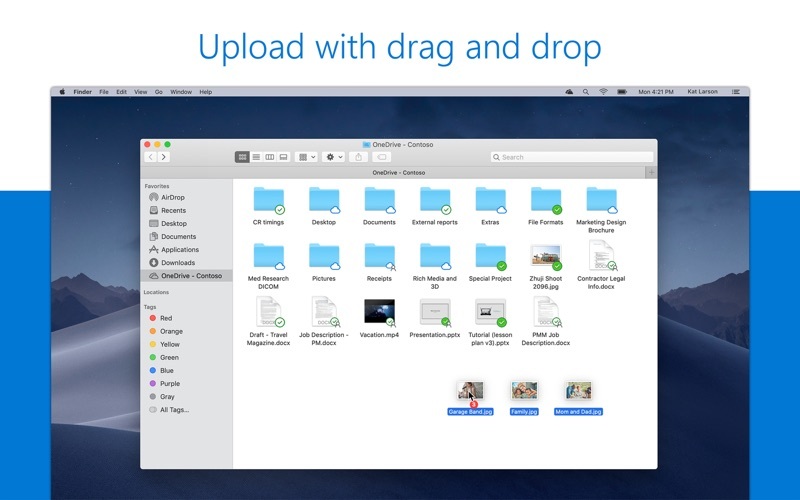 Securely share files and work together in real-time using Word, Excel and PowerPoint across web, mobile and desktop. Controls for security OneDrive helps protect your files. You can easily recover files from accidental deletes or malicious attacks and administrators can manage security policies to help keep your information safe. Note: For you to sign in to OneDrive for Business, your organization needs to have a qualifying SharePoint Online or Office 365 business subscription plan. 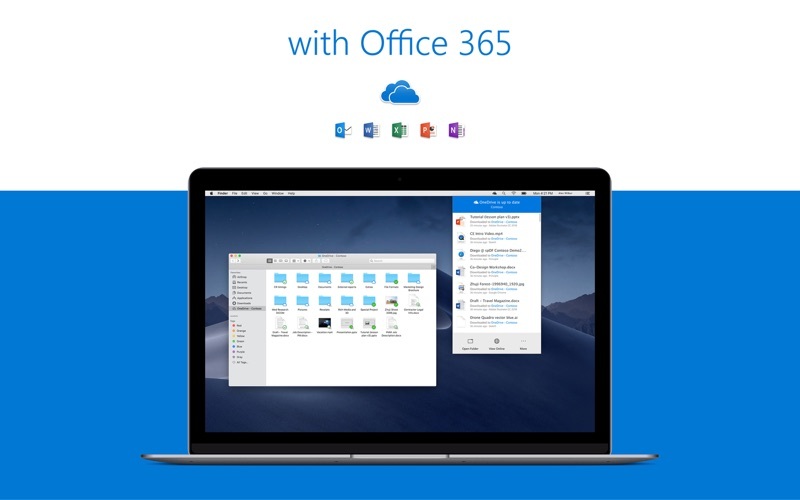 Learn more about Office 365 Office 365 is a cloud-based subscription service that brings together premium versions of Word, Excel, PowerPoint, Outlook and OneDrive, with the best tools for the way people work today. Please visit: http://go.microsoft.com/fwlink/?linkid=2015120 for information on Licensing Terms. Unlock the full Microsoft Office experience with a qualifying Office 365 subscription for your phone, tablet, PC, and Mac. Office 365 annual subscriptions purchased from the Word, Excel, PowerPoint, Outlook or OneNote apps will be charged to your App Store account and will automatically renew within 24 hours prior to the end of the current subscription period unless auto-renewal is disabled beforehand. You can manage your subscriptions in your App Store account settings. This app is provided by either Microsoft or a third-party app publisher and is subject to a separate privacy statement and terms and conditions. Data provided through the use of this store and this app may be accessible to Microsoft or the third-party app publisher, as applicable, and transferred to, stored, and processed in the United States or any other country where Microsoft or the app publisher and their affiliates or service providers maintain facilities. Please refer to the Microsoft Software License Terms for Microsoft Office. See “License Agreement” link under Information. By installing the app, you agree to these terms and conditions. it's hard to imagine that a company this big could make tech this bad. Constant errors, sync problems, forget about multiple computers. Absolute time-wasting trash. I thought it was syncing my files but discovered it wasn't, and hadn't been for over a year. It doesn't stay connected and is frankly worthless to me. Great product, allows my team to efficiently share necessary documents. OneDrive won't run on my Mojave 10.14.4 When I go to support I get this notice: Service Unavailable HTTP Error 503. The service is unavailable. I guess I will wait for an update. 1 star til then. It broke my concentration with a popup asking for a review. So here's your review. 1 star. Maybe be more respectful of your customers. Can't sync files on my Mac. Just errors out. OneDrive for Business crashes almost daily. I can move a lot of files around and could be bogging down the app, but the reason for my 1 star rating is because there is no way to Force Quit OneDrive when it does lock up. My only option is to reboot and hope I didn't lose any updates in the process.